Frame purses are usually composed of two parts: a fabric body attached to a hinged frame, often made of metal. The purse's rim is fitted into the purse frame, and usually held together with heavy duty fabric glue. There are a number of things that may need to be repaired on a metal-framed purse. The fabric may be ripped or stained, or the seams may separate. Similarly, if you often carry heavy things in the purse, the frame may begin to pull away from the fabric. The frame itself may also break, often at the clasp or hinge. Examine the purse to determine if the problem can be fixed without separating the frame from the purse body. If the problem is with the frame itself, particularly the hinges, you will probably need to remove it to fix it. Similarly, the frame will need to be removed if it is separating from the purse's body. 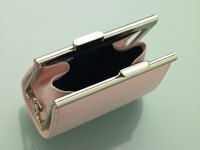 If the problem is with the purse body, you may be able to repair it without separating the two pieces. Repair any problems with the purse's fabric body by stitching or cleaning it, preferably without removing the frame. You can also use a patch to fix less visible areas -- like the purse's lining -- or style it like an embellishment, by neatly stitching a prettily patterned patch on the purse's exterior. Remove the frame, if necessary. The upper flaps of the bag will be glued to the frame using heavy duty fabric glue. Work the tip of a pair of pointed scissors under the edge of the frame, near the hinge, and gently pry the fabric loose. If the glue is holding firmly, you can soak it to loosen the glue (avoid this technique if the frame is metal) or use a glue remover to loosen it. Repair any issues with the frame by replacing the pin in the hinge, which may come loose and cause the hinge to gape. You may also need to use pliers to bend the clasp so it will close properly, if you have a bent or twisted closure. Some frame issues cannot be repaired; if this is the case, substitute a new, similarly-shaped and sized frame for the old one. Scrape any excess glue off the frame and the purse, in preparation for replacing the purse body in the frame. A goo-dissolving agent can help remove glue from the crevices of the frame; check to ensure your chosen product is safe for the type of frame you are using. Apply a thin strip of heavy duty fabric adhesive to the top rim of the purse. Apply glue thickly inside the channel of the purse frame. Allow the glue to set for 15 minutes to minimize mess and ensure a quick hold. Working carefully, press the rim of the purse into the purse frame, beginning at one of the hinges. Use a pair of scissors to work the fabric securely into the frame. Let the glue dry completely before using. If you absolutely cannot remove the purse flaps from the frame, you may need to cut the fabric -- as close to the edge of the frame as possible -- and scrape the glue out of the frame. If this occurs, assess whether the problem with the purse is bad enough to justify cutting the fabric. After cleaning the frame, restitch the top of the purse and glue it back into the frame, as directed. When replacing the purse body into the frame, use tape to mark the edges and protect the purse fabric from excess glue. Peel off once the glue is mostly dry.